These interactive maps provide state-by-state data on participation in breakfast and lunch service through the Summer Nutrition Programs, which include the Summer Food Service Program (SFSP) and the National School Lunch Program (NSLP) and National School Breakfast Program (SBP) through the Seamless Summer Option (SSO). Follow this link to the interactive tables. For more information, check out our Hunger Doesn’t Take a Vacation: Summer Nutrition Status Report, which measures the reach of the Summer Nutrition Programs in July 2017, nationally and in each state. Lunch Service: the lunch service map represents the ratio of July 2017 summer lunch participation to free and reduced-price NSLP lunch participation during the 2016-2017 school year. Darker shades of green indicate higher participation ratios. Breakfast Service: The breakfast service map represents the ratio of summer breakfast participation to summer lunch participation in July 2017. Darker shades of orange indicate higher participation ratios. 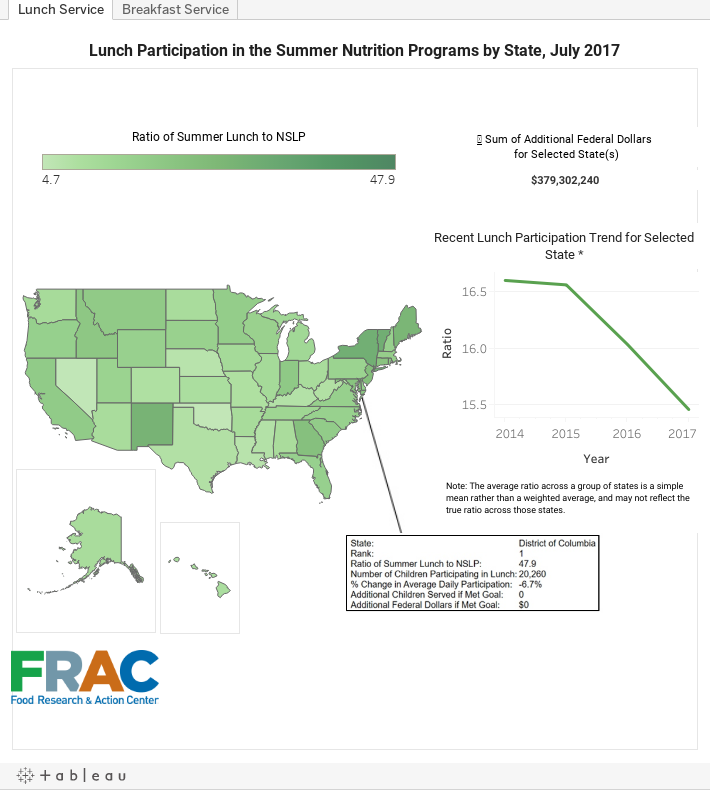 These data are based on FRAC’s analysis of administrative data shared with FRAC by USDA and state nutrition and education agencies, and are featured in FRAC’s summer nutrition reports: Hunger Doesn’t Take a Vacation: Summer Nutrition Status Report (released June 13, 2018) and Hunger Doesn’t Take a Vacation: Summer Breakfast Status Report (released June 14, 2018). Note: Works best in Chrome and Firefox. Data last updated June 2018.